In a banner year for Stephen King enthusiasts that saw the release of four different feature film adaptations and a television series to boot, one effort was destined to carry the torch. With all due respect to the long-awaited Dark Tower film, It is undoubtedly King’s most iconic work, one that has endured for years thanks in large part to a generation-scarring TV movie. Say what you want about Tommy Lee Wallace’s seminal film, but it certainly played some role in setting the bar for what always felt like an inevitable redux. Appropriately enough, Andy Muschietti’s take stepped into the long shadows of expectations 27 years later and did so with aplomb. A resounding hit with both audiences and critics alike, It is a legitimate phenomenon, if not a generation defining horror event. They don’t come around like this very often, and I was quite pleased to be among the enthused, albeit with the caveat that It: Chapter One felt like just that: an opening salvo that needs its second half to deliver upon its immense promise. While you’d like to meet a film on its own terms, it’s nearly impossible with this one since King’s novel intertwines past and present to form a voluminous rumination on trauma, friendship, and survival. Only time will tell if Muschietti completely captures the essence of It, but for now we can have faith in the foundation he’s built thus far. A revisit confirms as much: It is one hell of a horror movie, as Muschietti imagines King’s novel as the sort of film James Wan has helped to popularize in recent years. Not only does it boast a rollicking series of exquisitely orchestrated scares, but these sequences are also threaded through terrific character work, as the Loser’s Club is brought to life by a tremendous ensemble that manages to capture the essence of King’s affable gang of bullied, forgotten misfits (save perhaps for Mike Hanlon, who nearly feels like an afterthought here). There’s an immediate connection with the characters (and these actors in particular) that leaves me hoping Muschietti will have them return for flashback sequences in the second film. Of course, we don’t have to worry about that when it comes to Bill Skarsgard, who almost certainly will be returning as Pennywise for Chapter Two. Given that he stepped into Tim Curry’s legendary shoes, Skarsgard arguably had the tallest task of anyone involved here, making his turn also the most impressive. Granted, nobody will ever erase Curry’s take on King’s fiendish killer clown, but Skarsgard more than earns his place alongside such company. His Pennywise is something the horror landscape has been sorely lacking in recent years: an instantly recognizable, almost infectious boogeyman who commands the screen whenever he appears. You find yourself eagerly awaiting his attempts to terrorize these children much in the same way you anticipate Freddy Krueger and his infamous nightmares. Anyone who’s been paying any kind of attention to this site during the past ten years realizes that’s high praise, and I can’t wait for Pennywise to return in a couple of years, especially since we’re not likely to ever see the Springwood Slasher ever again. Thankfully, there’s more than enough promise that Muschietti is set to deliver a hellacious answer in a couple of years: there’s more than a few nods to the cosmic scale of King’s work, and he grasps the notion of an inexplicable, Lovecraftian evil rotting at the center of Derry, one of King’s most notorious bad places. With the childhood portion of the story now in the rear-view mirror, here’s hoping the next chapter fully captures the deeply disturbing heft and gravitas that gives the novel its weight and indelibility. If Chapter One is an pre-adolescent summer break nightmare soaked in an incongruous nostalgic glint, then Chapter Two needs to be a searing, ruminative comedown. Only then will It truly be able to rank among the absolute best King adaptations. For now, however, it’s the centerpiece of the author’s recent renaissance and assures we’ll be looking back fondly on 2017, which is no small feat considering how The Dark Tower actually turned out. After a phenomenal run at the box office, It arrives on home video as one of the most anticipated releases in recent memory, and WB has mostly delivered a deserving disc. In addition to a top-notch presentation (let’s just say it was a great disc to break in my newly-purchased TV), it also boasts about an hour of special features. 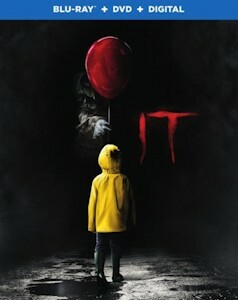 A trio of featurettes make up the bulk of the content, with “Pennywise Lives!” and “The Loser’s Club” focusing on the cast’s experiences during the production. Both clock in at around 15 minutes and feature brief interviews with the main cast, plus Muschietti and his sister Barbara, who served as the film’s producer. Most of it is standard EPK stuff, though audiences are treated to some pretty insightful on-set footage. You also get the sense that this crew had the time of their lives--including Skarsgard, who made it a point to genuinely unsettle these kids. The third featurette, “Author of Fear,” is exactly what you expect: a brief overview of It with King himself as the interview subject. Enthusiasts will likely find nothing new here as he recounts the experience of hatching and writing It, but it’s always nice to see the man himself nonetheless, who often brings a lot of energy to promoting his adaptations (he even appeared on the Dark Tower Blu-ray!). Whispers about a possible director’s cut (not to mention the sheer volume of stuff that was likely excised in adapting such a tome) lend a lot of intrigue to the cutting room floor here. About 16 minutes of deleted/alternate/extended scenes offer a glimpse, with almost all of it amounting to small character moments. Don’t expect to see much in the way of new Pennywise footage, save for the gag take on the film’s opening scene that kicks off this reel of deleted material. Other highlights include a terrific scene at Stanley’s Bar Mitzvah that probably deserved to make the final cut (here’s hoping it appears as a flashback in the next film, if nothing else), plus an alternate ending that I’m conflicted about. On the one hand, it’s easy to see why Muschetti opted not to go with a slightly cliched final shot; on the other, it feels a bit more appropriate and ominous than the actual ending. Long time home video collector’s know the drill here: with a second film due next year, it’s easy to imagine Warner Brothers trotting out a more impressive release down the line, whether it’s in anticipation of part two or alongside it in some sort of ultimate collection. If that’s the plan, then WB has at least provided some reason to pick this release up--of course, if I’m being real, I would have eaten up a bare bones release since It is that satisfying.